We are often sought out for Amish swing sets in Delaware and Maryland because of our customer service. We are truly dedicated to delivering you the service you deserve. This includes making ourselves available to answer any and all of your questions. When you’re unsure of something, give us a call! We are more than happy to discuss our Amish swing sets with you in detail. Our customers turn to us for vinyl playsets and quality structures like storage sheds, custom Amish built modular garages, gazebos, pergolas and more because we offer a wide range of options for these items. We have swing sets in stock that come in all different kinds of styles and setups, allowing you and your children to choose the set that best meets your needs. It is clear that when you’re looking for a new swing set for your backyard, you need to see us at Amish Structures. We provide vinyl and wood playsets that are fun, built from the best materials, and extremely safe. If you live in the Maryland or Delaware, contact us for more information today! There’s nothing that active children love more in their backyard than Amish swing sets. While there are many different types of swing sets and playsets to choose from, none prove to be as beneficial to your household and family as ones that are vinyl. Thankfully, you can come to us at Amish Structures to purchase your own vinyl or wooden swing sets in Maryland. We are a business that provides quality Amish outdoor structures in Queenstown, MD. 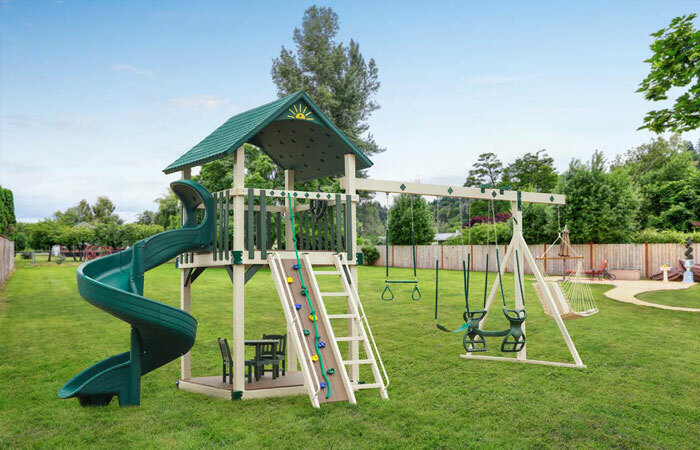 All of our Amish playsets and swing sets are super durable and made of the finest materials. When you purchase one of these high-quality vinyl swing sets for your backyard, you don’t have to worry about it falling apart or breaking. An Amish swing set from Amish Structures is built to last and will give you years of satisfaction! In fact, our swing sets are designed with wider bases compared to the more traditional playsets. It’s these wider bases that help prevent the units from tipping over, which is a crucial feature to ensure your child is secure while out in the backyard. If you’re searching for wood swing sets in Maryland Amish Structures is your go-to business. The high-quality Amish swing sets for sale that we offer are long-lasting outdoor structures constructed by authentic and talented Amish craftsman. Wooden Amish swing sets are great for a number of reasons. They’re long lasting, they remain sturdy in changing weather conditions, and are extremely attractive. The genuine and traditional look of an Amish swing set is sure to give your property a cozy and inviting feel. The structural timbers and bars used in our swing sets are quality selected from exterior-use pressure-treated pine which reduces warping. All corners are rounded for safety to reduce the chance of splinters. Hardware is plated to resist rusting, and swing bearings are made of nylon for a long, “quiet” life. Also, sliding boards are made of durable plastic for safety, comfort and quality.